I was in an SUV, gliding across an endless silvery-white expanse, leaving a white cloud behind me. I felt as if I was on the Chandrayan Mission. Then I was reminded that this ethereal odyssey was indeed taking place on earth, by an infinite blanket of blue teasing the salty sprawl with its equally salty, frilly waves. 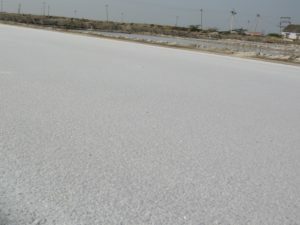 It seemed to clothe the salt pan in a gorgeous sea-blue skirt that might have been stitched by the mermaid queen ruling the Gulf of Mannar and the Indian Ocean surrounding me. She would be welcome at Aqua Outback resort, where I was headed. 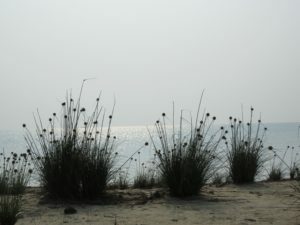 I was at the very edge of the Indian peninsula and I had to pinch myself out of a dream. As I drunk in the scenery, two spots of yellow popped up from nowhere. 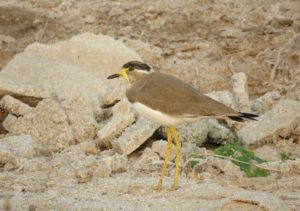 On closer observation, I realized that it was a Yellow Wattled Lapwing couple. Suddenly, they stopped flipping their wings and froze. Then, I realized that they were signalling their young ones about an intruder’s presence. That intruder was me. 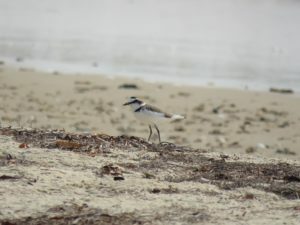 I turned my attention to coffee-brown and white birds being chased by the playful waves. 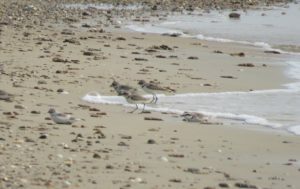 It was a family of Kentish Plovers enjoying yet another day on the beach. 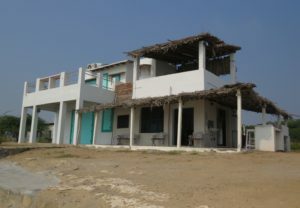 I crossed the salt pans and reached Aqua Outback resort. I was graciously welcomed by Rohini Motha, who offered me spiced tea. 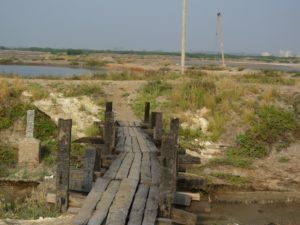 She explained the topography of the resort and how she transformed it into a highly sought-after adventure spot in Tuticorin. Then, we settled down to a sumptuous breakfast with Arjun, Rohini’s son. I also had a delightful chat with rest of the Aqua Outback team. Having finished my breakfast, I diverted my attention to winged breakfast-hunters. 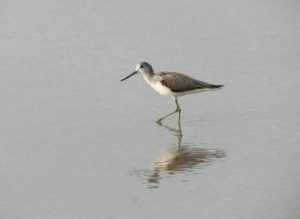 The Marsh Sandpiper was browsing through the salt harvest in the shallow waters. He knew that there was a treasure of molluscs, crabs and shrimps hidden there. 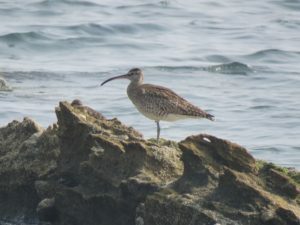 I spotted a brown and white head with a long, stick-like beak. 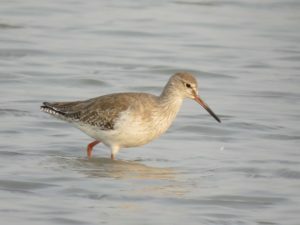 It was the Common Redshank, clad in a stunning geometric coat of feathers. I wondered why they called him common! Meanwhile, he was keenly noticing me and I began feeling uncomfortable. I quickly shot a photo of him and moved on. 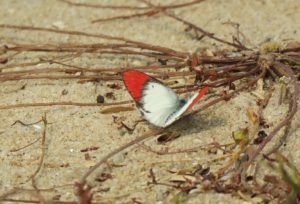 Then I spotted two fluttering white wings with a spot of flaming scarlet at the edges. 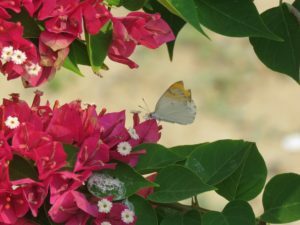 It was a scarlet-tipped butterfly, tangoing like Sophia Loren, as a bougainvillaea demanded her attention. 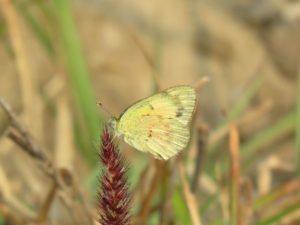 Or perhaps she was playing hide-and-seek with the orange-tipped butterfly dancing amidst the flowers. 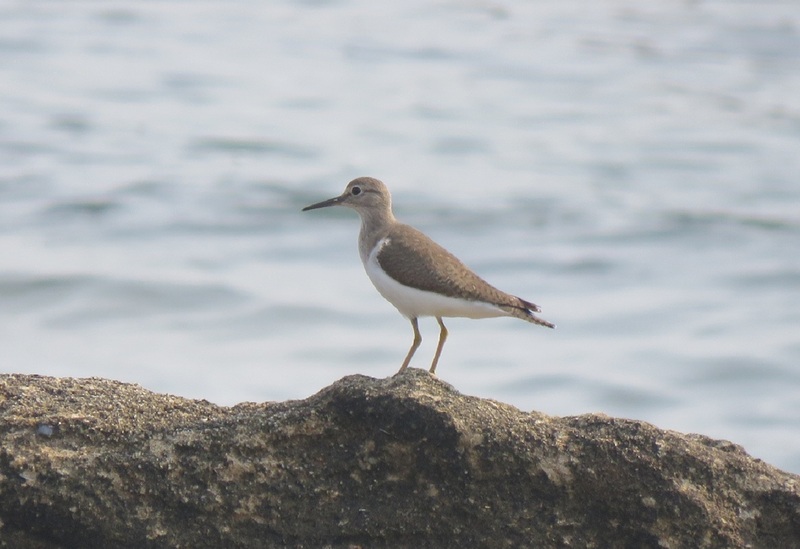 Then I noticed a long-legged winged supermodel sunbathing on the rocks and looking out at the Gulf of Munnar. 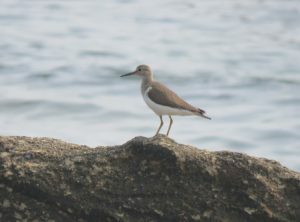 It was a Whimbrel being admired by a Common Sandpiper who was there for his daily dose of Vitamin D.
The experience was completely new even for a birdwatcher like me, for I am used to sanctuaries and dense forests. It was exciting to spot my favourite tweeters amidst a blue-and-white terrain. After exploring to my heart’s content, I met Arjun Motha, who is a passionate environmentalist, marine conservationist and fitness freak. He reintroduced me to the Aqua Outback experience through his unique perspective. There were more activities like kayaking, snorkelling, kite surfing and stargazing which promise a one-of-a-kind adventure. I was also treated to lip-smacking food at the resort.